Elijah Mobley M.D. is a general surgeon who works with patients in Victorville and throughout Apple Valley, as well as those in Glendora and the Los Angles area. He operates out of Victor Valley Community Hospital and St. Mary’s Medical Center. As a surgical expert, Dr. Mobley is certified by the American Board of Surgery. He makes an effort to be a member of many different medical professional organizations in order to provide his patients with the latest technology and the most innovative techniques. He is an active member of the AASLD, ASTS, AST, AMA, SAGES and SCCM. Dr. Mobley began his educational career at Florida A&M University, where he earned a bachelor’s degree in premedical. He went on to earn his medical degree from Meharry Medical College. After completing medical school, Dr. Mobley went on to the King/Drew Medical Center, which is based out of Los Angeles. He completed his general surgery internship and his residency at the King/Drew Medical Center. While Dr. Mobley was starting his career as a surgeon, he was at the same time caring for his father-in-law who was in need of a kidney and liver transplant. During this time, he took an exceptional interest in the transplant process and began research about transplant surgery. He decided that this was the path he wanted to take during his career as a surgeon, and he went to St. Vincent Medical Center and the NYU Medical Center in order to complete his Transplant Fellowships. At this time, he was able to train with some of the top transplant surgeons in the country. After his fellowships had been completed, he accepted a position as a transplant surgeon at the Avera McKennan Medical Center. However, Dr. Mobley desired to improve his skill set as a surgeon and broaden his horizons. 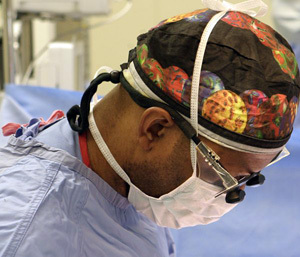 After working as a transplant surgeon, he decided to pursue a Surgical Critical Care Fellowship. He completed this particular fellowship at Cedars Sinai Medical Center. Again, Dr. Mobley was given the opportunity to work side-by-side with some of the most highly-skilled surgeons in the Los Angeles area. With a passion for fine-tuning his skills and experience, Dr. Mobley also worked with the finest surgeons in the area in order to complete a Minimally Invasive Surgery Fellowship. Dr. Mobley has an ability to relate to his patients on a personal level. He is described by the office staff as being a “people person,” and is known for taking the time that is necessary to truly have a conversation with his patients. Dr. Mobley recognizes that patients who need surgery are going through a difficult time, and he is known for his attentive, caring and understanding bedside manner. Dr. Mobley ensures that patient care is his top priority. He feels that every person deserves kindness, compassion and quality health care. He works hard to be sure that every patient has all of their questions answered and their needs met as he wants everyone to feel completely comfortable during the surgical process.